Happy Friday! One of the benefits of living on the East Coast again is its proximity to everything. Yes, Chicago is a travel hub, but somehow I never went east. Thus, this weekend we're going up to NYC for the first time in nearly four years. It'll be a relatively quick trip even though Monday's a holiday for MLK day but our schedule's jammed pack. Anyway, onto today's recipe. As I was going through my camera, I noticed a few pictures that I'd never posted on my blog. 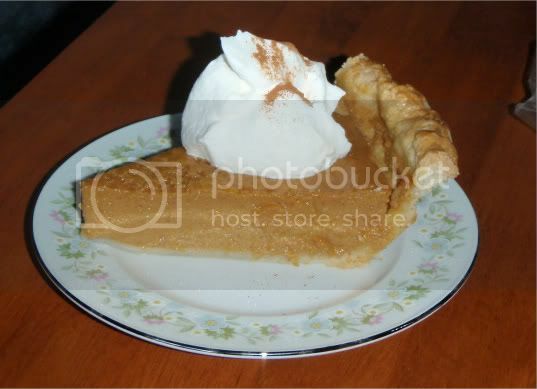 This one is of the pumpkin pie I made this past Thanksgiving. I used the recipe from the back of the Libby's canned pumpkin which is a family favorite. What I didn't know, since I don't eat pumpkin things, is that I was supposed to omit the cloves and ginger because they're a bit overpowering. But my family was super nice about it and ate it anyway. Actually, a certain person ate half a pie, so it must not have been too bad.